Notices about jobs and consulting opportunities will be posted here. To request job postings, contact us. The Amherst Public School District is seeking candidates for a Bilingual (Spanish) Special Education teacher with duties to include both instruction and assessment at Fort River Elementary where we are starting a Spanish English Dual Language program in the fall of 2019. We are seeking candidates with interest and expertise in co-teaching. Applicants must have their Massachusetts Department of Elementary and Secondary Education Special Education license for K-6. Bilingual/ Bicultural applicants preferred. This is a full time position. • formal and informal assessment of student achievement and writing evaluation reports (in both Spanish & English). MA DESE is hiring in the Center for Educational Options, whose mission is to expand and enhance high quality educational options for learners of all ages, and ensure equitable access for all, especially for those who have been historically underserved. Amigos JK-8 Two-Way Immersion School. The Amigos School seeks to hire a Bilingual Math Teacher/Interventionist to join our diverse, committed, and passionate community. This individual will be responsible for providing math support to identified students within a multi-tiered system of support. The successful Two-Way candidate will have experience planning, implementing and adapting curriculum, based on the Massachusetts State Frameworks, and the Common Core. The successful candidate will set high expectations for all students, and utilize scaffolding and differentiation to support students in accessing all language and content material. He/she will also have experience working with students in math providing support and intervention. You can find the full job posting HERE. Please reach out should you have any questions. Framingham Public Schools is actively looking for qualified bilingual staff for its brand-new Portuguese Two Way Program at the elementary level, grades K and 1. Please apply through the Framingham Employment site. Dual Language Programs: Two-Way Portuguese Positions at Framingham Public Schools. Please see the attached job posting for a Dual Language Coordinator in Southbridge, Ma. 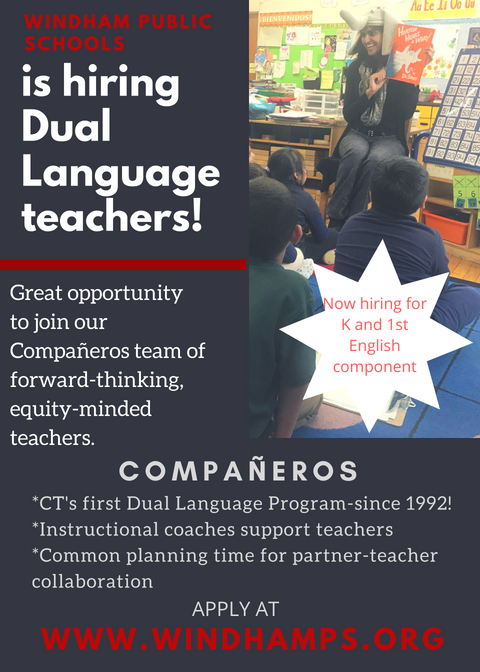 Please visit the Cambridge Public Schools website for job postings at the Amigos JK-8 Two-Way Immersion School. Framingham Public Schools is looking to hire a Portuguese speaking Special Educator. Framingham Public Schools is hiring for Portuguese-speaking elementary teachers. is hiring for a grade 2 TBE position at Brophy Elementary School. Framingham Public Schools is hiring bilingual educators, bilingual Special Educators, TBE and TW teachers, ESL teachers, English Language Development coaches. Here is the link to descriptions of positions. American Reading Company has openings for full-time and part-time bilingual coaches. The Unidos Program at the East Somerville Community School is searching for a dual language teacher for the Spanish two-way immersion kindergarten classroom. The Spanish lead teacher will work with the other Kindergarten teacher to provide 80% of the core content in Spanish and provide Spanish language arts to both kindergarten classes. The position requires Early Childhood certification and SEI endorsement. Framingham Public Schools is hiring bilingual educators, bilingual Special Educators, TBE and TW teachers. Please spread the word to interested candidates. Here is the link to descriptions of positions.